We’re Here to Help with Storm Cleanup of Your Yard in Minneapolis! How has your landscaping survived those terrible thunderstorms we got hit with earlier this week? If you’re like most homeowners in the Minneapolis area, you’re probably needing to do some post-storm cleanup. As we’ve traveled around the Twin Cities the last few days we’ve seen a lot of branches and limbs strewn everywhere and a surprising number of trees down in people’s yards. In situations like this everyone wants to get their yard cleanup done as soon as possible. But it’s very important to remember safety first. Following the simple guidelines listed below will ensure that the work gets done and everyone stays safe. Start off by making sure that no broken limbs or branches have fallen on power lines. If they have, you will need to contact your utility company for help. Removing debris from power lines is not something a homeowner should attempt on his own. This could easily lead to bodily injury. Next you will want to check trees for damaged branches. Oftentimes dead or diseased branches and limbs will break off during a storm and you’ll need to prune the remaining branch still attached to the tree. A good place to cut is just above the lateral branch, as it will encourage new growth. Cutting in the middle of the branch will result in a dead stub at the end of the branch. For safety reasons, however, never attempt to use a pole saw while on a ladder. The back and forth movement can result in tipping the ladder. Finally, if many large limbs have been broken off or if a tree has cracked or is in a leaning position, it is always wise to contact a professional landscape maintenance company for assistance. They will be able to tell you whether it is safe to leave the tree standing or if it poses a safety hazard and should be removed. 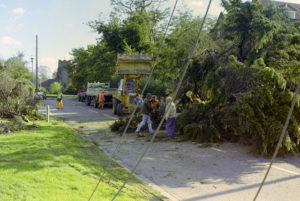 At ALD we have the experience, the expertise and the equipment necessary to take on any post-storm cleanup project. If you’re feeling overwhelmed by the looks of your patio or lawn, just give us a call. We’re here to assist you in any landscaping endeavor, be it design, installation or simply yard maintenance. We are a licensed Minnesota landscaping contractor. We serve the entire Minneapolis and St. Paul metro area.